1. Futuristic ultra-bright, palm-sized flashlight. 2. 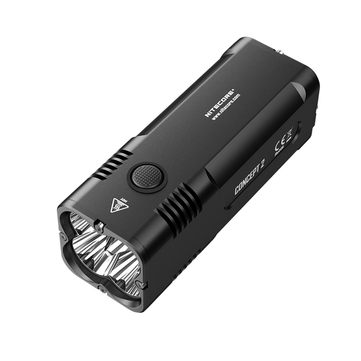 Utilizes 4 XHP35 HD LEDs with a max output of up to 6500 lumens. 3. Beam intensity up to 39700cd and beam distance up to 435 yards. 4. Built-in 12400mAh Li-ion battery with high rate discharge. 5. Onboard intelligent charging circuit. 6. The single switch controls 5 brightness levels and 3 special modes.